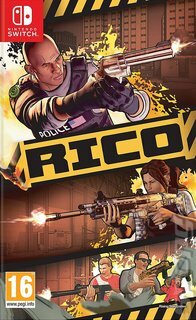 As a part of the RICO task force, your mission is clear: get in, take down the criminals and get out again. Sounds easy, but it's not - procedurally-generated cases mean you'll never know who or what's waiting for you. Pick your load-out, then use the element of surprise to get a tactical edge over the enemy. Unlock new weapons, mission types and traits, or dive into Daily Play and see how high you can climb the cop rankings! - Take down criminal gangs with extreme prejudice and solve the RICO case - you've only got 24 hours, detective! - Procedurally-generated cases mean no two games are ever the same - you'll never know what's waiting for you. - Crack cases with a friend, either online or locally, for co-op carnage. Two loose cannons are always better than one! - Daily Play cases - with leaderboards and rewards - keep you coming back for more, along with unlockable weapons, traits and mission types to discover.